Are Plastic Bag Bans Worth the Trouble? Plastic bag bans are gaining in popularity with cities, counties, states and even countries joining the movement. We have covered the two sides of the plastic bag ban debate before, and just last week we went over the positives to banning plastic bags. We decided to revisit whether plastic bag bans are really worth it and the drawbacks of banning plastic bags. Plastic bag bans negatively impact manufacturers. Bans reduce the demand and can completely wipe out a manufacturer’s business. Plastic bag bans may cause a manufacturer to lay off employees or possibly even close down. This can have a significant impact on employment rates in a community. With some modifications, many disposable bag manufacturers can begin to produce more durable, reusable bags. This can save jobs and allow a manufacturer to stay in business. This solution requires an investment and may not be a good fit for every business. Although, if a business is not able to adjust to changes in the market they may be doomed when any changes occur. With plastic bags no longer available, shoppers need to find another way to carry their purchases home. Many retailers sell reusable bags to fill this need; however, reusable bags can cost anywhere from $1 up to several dollars per bag. This expense can be significant for low-income families or others on fixed incomes. Many plastic bag bans include language written into the law that provides assistance to low-income individuals. This ensures a ban will not cause a financial hardship for residents. Many businesses also give out branded reusable grocery bags when a ban goes into action. Custom reusable bags are highly effective promotional products that deliver a great return on investment (ROI). Plastic bag bans create a unique marketing opportunity for businesses to get the word out about their brand, while also supplying residents with bags they can use for their groceries and other purchases. Once a plastic bag ban becomes effective, shoppers need to get into the habit of bringing their reusable bags when they shop. Getting to the checkout line and realizing you forgot your reusable bags is frustrating. Given time, shoppers living in areas with plastic bag bans report that grabbing their reusable bags becomes habit. Different tips and tricks can be used to make grabbing your reusable shopping bags second nature. Implementing a plastic bag ban takes a lot of work, and getting used to the ban once it is in place takes time. Plastic bag bans can be a hassle, but for many municipalities, the trouble is worth the positives of banning plastic bags. Find out more about plastic bag bans all over the world with our map. This tool tracks the bag ban movement from the success stories to the near misses. Stay in touch with our newsletter and learn about developments, our latest eco special and more! 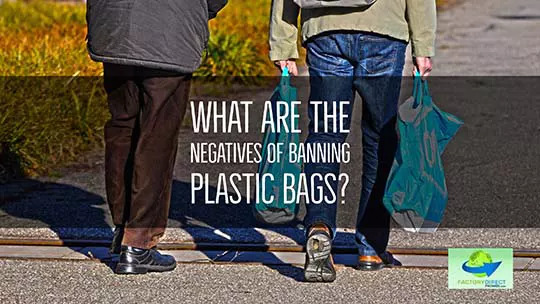 Previous Previous post: What Are The Positives to Banning Plastic Bags?